Linda Grimes: Visiting Reality : NUMB with Excitement!! 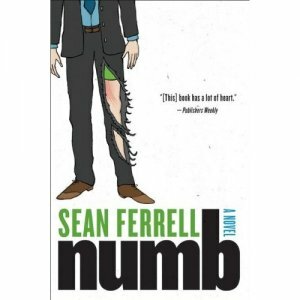 Numb, by Sean Ferrell, goes on sale 8/3/2010! I know this because a Twitter bud of mine, Harley May, is doing a bang-up job of pimping his novel (tee-hee--get it? "bang-up" and "pimping" in the same sentence?) over at her blog. Go check it out. Really. Go now. There may be a quiz. There. Did you look? Did you see there's a contest? 1. A man engaged in a lion fight. 2. Someone hammering a nail through their body for profit. 3. A man on fire. Now, since I am such a badass rebel (and a writer who can't resist editing), I took it upon my presumptuous self to consolidate ALL THREE scenes into one SUPER EXCITING image!!! Cuz that's just the way I roll. So, here you have it. My (loose) interpretation of the events in those scenes: a man in a fireplace, on fire with fear because he is being attacked by a ferocious lion, just when he was about to pound a nail* into himself for money! *Okay, so he's holding a screw. "Getting nailed" means the same thing as "getting screwed," right? Synonyms count when you're a writer. Work with me here. Suspend your disbelief. Now, I realize taking these liberties with the rules may result in my disqualification from the contest. (Though, seriously, I think I deserve extra credit for creativity.) But that's all right. I was going to buy my own copy anyway. Words fail me. Really, I am utterly speechless. I'm with you on one thing though -- "screw" and "nail" are totally the same thing. Nice job, and good luck in the contest! Agreed! You totally deserve extra credit. Excellent! Bravo, Linda. It's clear, concise, and I love it. Gosh, I certainly hope he IS numb if he's going to have to deal with burns, nail wounds, and mauling by lions. What kind of Bactine would do the trick for that, I wonder? You should win for creativity alone. I am lobbying Harley May right now. Just kidding! I love it! Your vivid imagination surely resonates! Dude, that's the second time I've first published anonymously by accident on blogger today. I keep forgetting the pesky security code and hitting enter too quickly. Gah! Not bad for a loose interpretation. Driving a nail through one's appendage for profit and getting nailed for profit could both be equally painful for the poor gent, so I saw the screw stands. Patty -- Aw, thanks! Too bad you're not judging. Dianne -- The character can't feel pain. Which does come in handy when you're being mauled, nailed, and burned. Muffintopmommy -- Or should I call you "Anonymous"? And, yes, you should be afraid of my imagination. Very, very afraid. Bwah-ha-hah! LadyGenette -- Thanks! And, yeah, jail does have a way of eating into profits, I hear. Alright, the pimping is working. I'm going to have to buy this book. Although his Numb Video made me spit fudge round on my laptop, so I was probably sold at that moment. Awwww, what a cute--er, I mean, ferocious man-eating lion. Good luck!